Boring day, I should say? 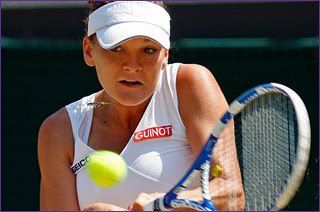 Besides Dinara Safina, who was made to sweat by Sabine Lisicki, other favourites easily sailed through to the semifinals. 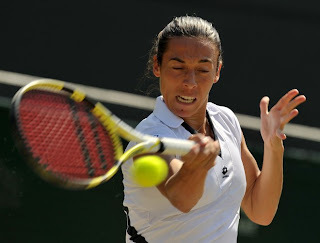 Safina who thought she was a Santa Claus on court yesterday, served 15 double-faults! However, the top-ranked Russian reached the Wimbledon semifinals for the first time after a 6-7 (5), 6-4, 6-1 victory of unseeded Lisicki. 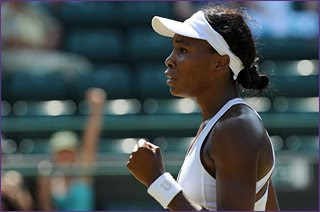 Venus Williams, the favourite to win the Wimbledon again seems too hot for Agnieszka Radwanska to handle. Venus's baby sister Serena who was out on a revenge against Victoria Azarenka with a 6-2, 6-3 win. Serena admitted that the heavy defeat inflicted on her by Azarenka earlier this year in the Miami final did much to fuel her victory. Finally Elena Dementieva also performed a "Williams" demolition job on Francesca Schiavone, winning 6-2, 6-2. Tonight the gentlemen will play for places in the semifinals.